"It's enough to indulge and to be selfish but true happiness is really when you start giving back." The Fort Worth Chapter of the EGA has many opportunities for its members to give back to others. We have volunteer opportunities through donations of items, money and time. Fort Worth Day Resource Center - From showers, storage, laundry, and mail to individual case management, health screenings, job search and housing assistance, the Day Resource Center works to make homelessness a season of life, not a way of life. Today the center helps more than 2,800 people a year; that is about 200 to 400 people a day. Log Cabin Village* - The Log Cabin Village is a living history museum owned and operated by the City of Fort Worth. The Village is devoted to the preservation of Texas heritage. We have various opportunities for volunteering throughout the year. Onsite Embroidery: This gives you an opportunity to have some embroidery time and help the Village. You simply will spend time working on your embroidery while sitting within the Village visiting visitors and telling them about embroidery. Log Cabin Summer Camp (June): Beginning Embroidery - We are being allowed to teach students between third and eighth grades about samplers. We will be taking time to put kits together in the Monday Day Meeting in May then teaching three classes during June. Log Cabin Fall Fest: In October the Village invites different organizations to show off the skills Texas settlers would have used during the mid 1800's. We will have 80 kits to be passed out to kids containing a cross stitch project with a Halloween theme. 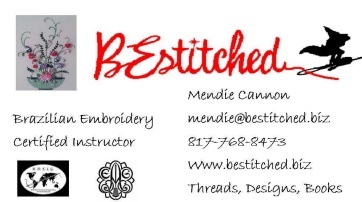 Volunteers from our Chapter will provide instructions on how to cross stitch. *To be able to volunteer at the Log Cabin Village, members will need to fill out paperwork for a background check. SafeHaven - SafeHaven provides shelters in Tarrant County specifically for victims of domestic violence. They do so through outreach, education, support and prevention efforts. We, as the Fort Worth Chapter of the EGA, bring personal hygiene items, clothing and other requested items.